Of all the things I’ve read this week, the article about a large scale study citing the health benefits of nuts was my favorite. And peanuts were included, so legumes count, too! You can take this study for what it’s worth. For me, it was an interesting read and an excuse to finally try this recipe for spiced walnuts using some fresh nuts from Oh Nuts! These nuts were so good that I literally had to put them in a corner and cover them with something so that I would stop picking at them. They’re made with a blend of cumin, ginger, cayenne, soy sauce and just enough sugar to open up the spicy flavor without making the mixture sweet. Or too sweet, that is. They’re sweet in the way barbecue potato chips are sweet, but not sweet like dessert. And they are addictive, so you might have to exercise some willpower if you want to stick with a handful. Just try them! They’d be perfect for setting out on Thanksgiving for pre-feast snacking (especially if you eat late like we do). 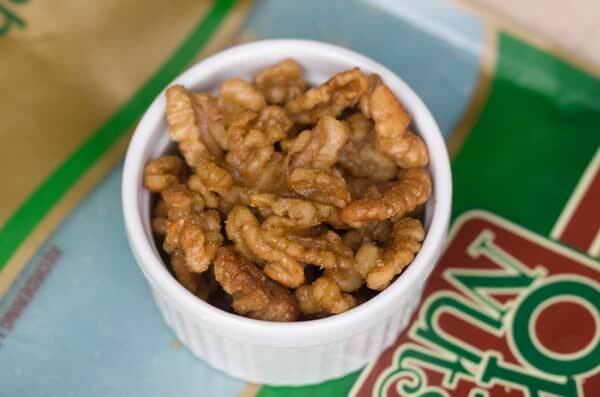 Toasted walnuts tossed with an addictive mixture of spices. Preheat the oven to 400 degrees F. and have ready a large, rimmed baking sheet. In a large saucepan, bring about 2 cups of water to a boil. Add the nuts and boil the nuts for 2 minutes (this removes some of their bitterness). Drain well. In a large skillet, melt the butter. Mix together the ginger, cumin, salt, cayenne and granulated sugar and add to the butter. Add the soy sauce. Add the nuts and toss until nuts are warm and coated with the spice mixture. Spread nuts on a baking sheet and bake for about 8 to 10 minutes or until they are lightly toasted. Let cool and crisp. If they're not spicy enough for you, sprinkle with red pepper flakes. For the cashew version, use the same amount of roasted and lightly salted cashews, but omit the salt from the spice mixture. 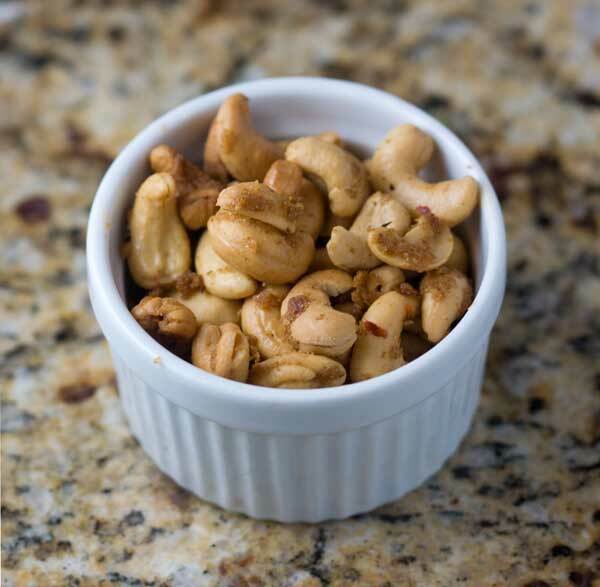 Since the cashews are already roasted, you'll only need to bake them for about 8 minutes at 350F or just until they brown. For extra heat, sprinkle with red pepper flakes. You may want to add a pinch or two of extra sea salt was well. Raw cashews might also work, but I only tested with roasted & salted. Katrina, let me know if you try these. My family loves these even more than cookies! Mmmm! I just got a huge order from Nutty Guys and nuts are in stock here. All the nuts I got are raw, but I just roast them myself.